Beachcombers Bazaar Henna Studio and Supply: Henna Tattoo on a Bet! 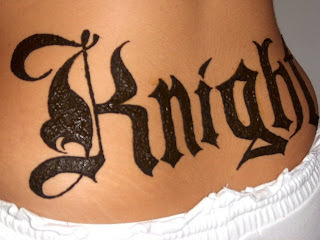 Henna Tattoo on a Bet! Melissa lost a bet with her fiancee playing a game of pool. The bet was that the loser would get the winner's name tattooed on their body. Though, she is typically the better pool player, Melissa lost this round. The exact words that were used for the bet was she had to "get a tattoo of his name on her body". Since there was no specifications other than that, Melissa outsmarted her fiance and got a henna tattoo! Henna is a permanent stain and does not fade away. The "fading" of the tattoo is actually your skin cells exfoliating off. Melissa came in the shop last week for a henna tattoo of her fiancee's last name. The tattoo was to be 4-6 inches high and on her lower back. It turned out to be fabulous! She picked out a style of letters that she wanted and we made a few changes with some of the letters. We made the design a bit smaller in the center widening as it expanded to both sides. The entire henna design was free-hand. Thanks! What cool work on yours too! New Sign and Awnings for Beachcombers Bazaar!